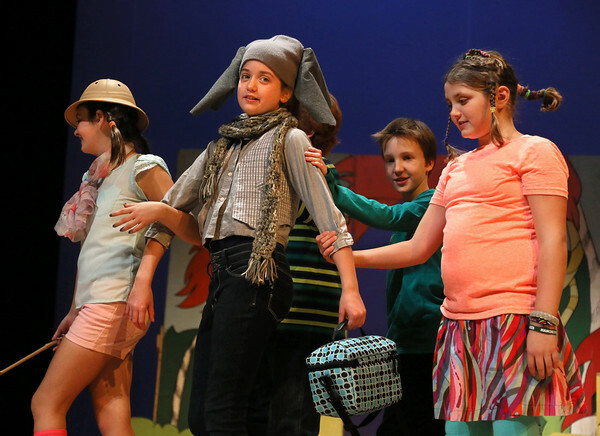 Seventh-grader Greta Dickson, center, plays Horton the elephant as he is escorted to the zoo by hunters, from left, Gelsey McCue, Nathan Kelleher and Parker Brooks, all sixth-graders, in a scene from "Seussical Jr." at the Manchester Essex Middle School Auditorium in Manchester. The musical, based on characters and events in various Dr. Seuss books, is being produced in collaboration with the YMCA of the North Shore Theatre Company. Showtimes are this Friday and Saturday at 7 p.m. and Sunday at 2 p.m. Admission is $15 for adults and $10 for seniors and students.